US 93 passes over the Colorado via the top of Hoover Dam, which provides the only crossing point of the river for hundreds of miles, between Lees Ferry near the Utah border and Davis Dam at the south end of Lake Mohave. The road on both sides of the river is very steep, narrow and winding, and the approach from either direction is equally dramatic, as the highway descends several hundred feet through jagged, dark-colored rocks - the edge of the Black Mountains on the east side of the river and the Eldorado range on the west. 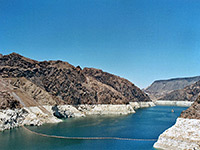 The rocks are twisted, weathered and completely devoid of vegetation, but they provide an impressive backdrop to the dam. At the time of construction (1935), Hoover Dam was the largest in the world and although long since surpassed it is still an amazing structure and a marvel of engineering - a huge, curving wall of plain concrete 660 feet thick at the base and 726 feet high set between the vertical walls of Black Canyon, accompanied by strangely-angled pylons, cables, power generating plants and other machinery. In 1955, the dam was selected as one of the Seven Modern Engineering Wonders in the USA by the American Society of Civil Engineers, and it is was later designated a National Historic Landmark. Also known as Boulder Dam, the usual name commemorates the 31st president Herbert Hoover, who was in office during the start of the project. New visitor facilities were constructed in the late 1990s including a multi storey carpark and open area cafe, both on the west side of the river, opposite the visitor center. Free parking is available at 13 lots along US 93 on the east side, the most distant being half a mile from the state border through the middle of the dam. 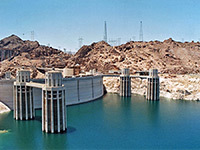 The facility is owned and operated by the Bureau of Reclamation who conduct guided tours down into the dam and around the generating rooms at the base. The tours used to begin via elevators right on the top of the dam, and generally required only a short wait, but now the entrance is through the new visitor center, and busy summer days may see several hundred people queuing in line, with a waiting time of up to two hours. There are two options; the 30 minute Powerplant Tour (2014 price $15 per person) explores the generating facilities (includes a video presentation and various exhibits), while the one hour Hoover Dam Tour (2014 price $30) additionally visits less well known areas inside the dam. If the wait for the tours is too long, there is plenty to see outside, by walking across the dam and a little way up the road on the east side. A good overall view can be had from the top of the multi-storey carpark - both of the dam and the new bypass bridge being built 1/3 mile to the south. 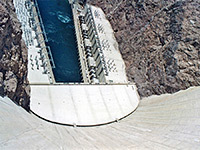 Other parts of the structure that can be inspected include the huge spillway channels (50 foot diameter) intended to take excess water if flood conditions exist, in which case the water flows along the original tunnels drilled through the rock that were used to divert the Colorado during construction of the dam. The spillways have seen action only three times since the dam was built, most recently in 1999 when record snowmelt along the rivers caused potentially dangerous water levels to build up. 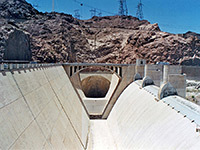 The Arizona spillway is most visible, right next to the main highway, though the equivalent channel on the Nevada side can be viewed from the end of a short road to the old visitor center, now used as a museum. The other prominent features north of the dam are the four intake towers, directing the waters through penstocks to the power generators at the foot of the dam. There are 16 turbine generators, producing up to 1,860 mW of power. The best overall view of the towers and the whole dam site is from the uppermost of the overflow parking areas along US 93 on the Arizona side, though apart from overlooks along the highway, viewpoints are somewhat limited as all the surrounding hills are strictly off-limits to hiking. The only other observation point nearby is Lakeview Overlook, a mile east of the dam in Nevada; the dam itself is out of sight but this does have an excellent vista over Boulder Basin and the south end of Lake Mead. US 93 is a wide dual carriageway for most of its length, as befitting the main route between Arizona and Nevada, but for a short distance either side of Hoover Dam it became a steep, narrow, two lane road with a 15 mph speed limit. This, plus the ever increasing traffic, recent security threats, and growth in visitors to the dam led to the decision, in 1998, to reroute the highway half a mile to the south, through Sugarloaf Mountain, crossing the Colorado via a 1,900 foot road bridge. The design process began in 2001, and the new route opened for traffic on October 19th 2010, albeit after a two year delay caused by collapse of an aerial tramway being used to transfer materials across the canyon. The three main components of the project were 2 miles of new road in Arizona, 3 miles in Nevada, and the bridge itself, 900 feet above the river. The old road is now used solely for visitors to the dam, and the section across the top is closed to public vehicles. 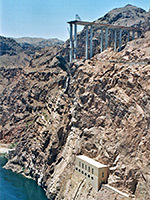 There are no parking places along the new highway to stop and observe the bridge, though a walkway along the north side is open to pedestrians and provides an excellent view of Hoover Dam, the top of which is about 1,500 feet distant and 100 feet below. The walkway can only be reached by a path starting near the dam, accessed by the old road - high concrete walls prevent any dam views from the new bridge.